Boca Walk is a quaint, lakefront neighborhood located in the larger planned residential community of Boca Del Mar in the heart of Boca Raton, FL. Originally constructed in 1983, Boca Walk is comprised of 144 townhouses and villas that are situated in a beautiful, park-like setting. 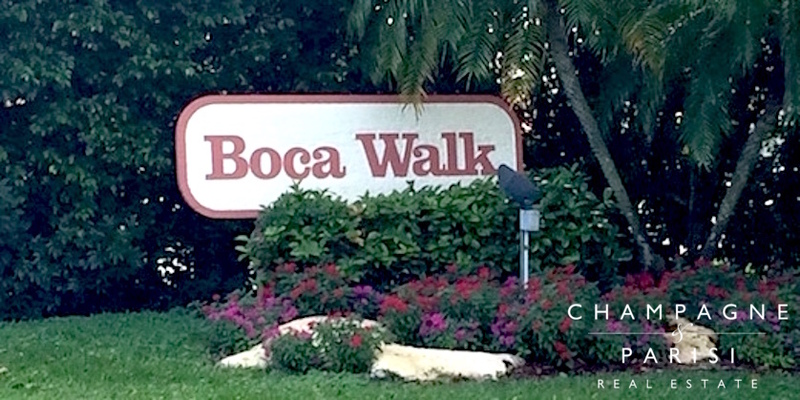 Included below are townhomes & villas for sale in the Boca Walk community. These real estate listings are updated every 15 minutes from the MLS with large photos, maps, local school info, and detailed property info. Townhomes for sale in Boca Walk offer two to three bedrooms and two or more bathrooms, ranging from 1,000 to 1,300 square feet of living space. These affordable units range from single-story villas to bi-level townhomes, many of which have been completely renovated. These charming homes offer many desirable features, such as new wood and tile flooring, updated kitchens and baths, spacious master suites, and large screened-in patios. Residents of Boca Walk enjoy the use of several great amenities such as a private clubhouse and a sparkling community pool. There is also an extensive sidewalk system throughout the Boca Del Mar community, offering residents the perfect place to bike, walk, and jog just steps from their front doors. Boca Walk has one of the most affordable Home Owner Association fees in the area, typically ranging from $314-$340 per month. The HOA fees cover the cost of building exterior maintenance, garbage and trash removal, upkeep of the recreational facilities, as well as neighborhood security. Boca Walk is situated within the larger planned residential development of Boca Del Mar, in Central Boca Raton, just West of I-95 at the Palmetto Park Road exit. This centralized location offers residents the convenience of being close to many of the area's best shopping, dining, and entertainment options. Town Center Mall is just minutes from the community, as well as local grocery stores, houses of worship, the local YMCA, and several excellent golf courses. Boca Walk is also just a short drive from the beautiful local beaches, Downtown Boca Raton, and many of the area natural parks. This family-friendly community is zoned for some of the top-rated public schools in the area, including Verde Elementary School, Omni Middle School, and Spanish River Community High School. If Boca Walk sounds like the perfect place to call home, you may want to visit similar townhome communities in Boca Raton, such as Courtyards at Boca, which also offers a great selection of affordable townhomes and villas for sale in a convenient location. If you would like to learn more about Boca Walk townhomes or any of the other residential developments in Boca Raton, please call us at 561-998-9015. You may also contact us by completing the brief form below and one of our expert agents will be in touch with you shortly. We at Champagne & Parisi Real Estate look forward to assisting you in finding your next dream home in Boca Raton, FL! Also, please consider registering for a free account which will enable you to receive automatic email notifications when new townhomes in Boca Walk come on the market in Boca Raton, FL.